Durham, Ontario Golf Course in Grey County with Rental Cottages! 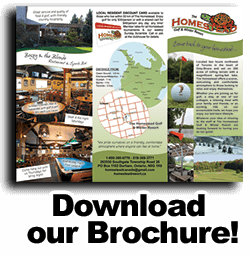 Located in Durham, Ontario, Homestead Resort offers 18 beautiful holes of golf. Our short par 69 golf course offers birdie opportunities for golfers of all levels. The Homestead golf course is maintained with a state of the art irrigation system, our greens are ideal for your game. Contact us today and learn more about our tournament packages available for your next event. © 2019 Homestead Resort. All Rights Reserved. Designed & Hosted by Gem Webb Internet Marketing & Web Design Inc.